Distribution map of ashy dogweed Thymophylla tephroleuca (Thymophylla tephroleuca). 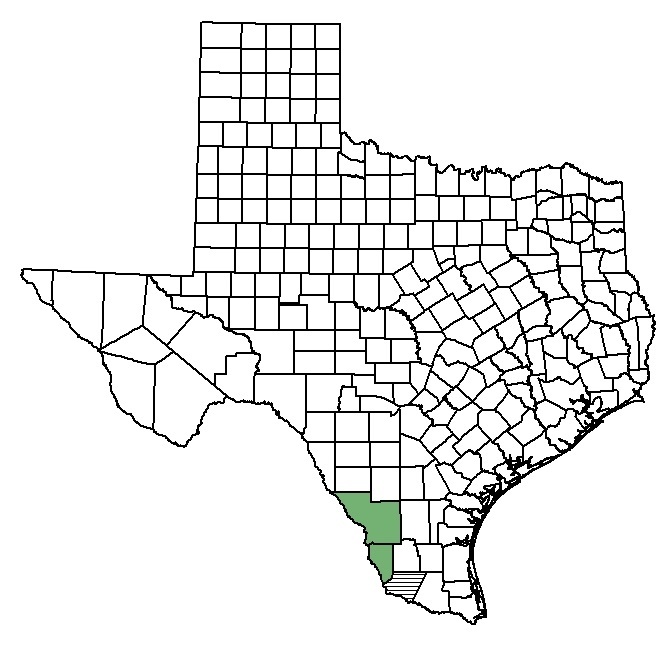 Ashy dogweed grows in South Texas Brush Country in Webb and Zapata counties and historically in Starr County. Ashy dogweed is an erect perennial with numerous, woolly, 10 to 30 cm tall stems and minute, oil-bearing cells which give off a strong aroma when the plant is crushed. The leaves are alternate, each leaf attaches at a different point on the stem rather than opposite each other. Leaves are slender or thread-like, 8 to 15 mm long and 0.3 to 1 mm wide, and sometimes divide into three branches at their tips. Floral stalks are capped with a yellow flower head consisting of a flat disc composed of 30 to 70 tiny flowers called disc florets surrounded by usually 12 to 13 golden yellow petals called ray florets. The petals are 5 to 8 mm long. Just below and cupping the flower head is a white, hairy, upside-down, bell-shaped structure, 5 to 7 mm tall (usually) and 4 to 8 mm wide. The black fruit is cylindrical to club-shaped with tiny ridges and 3 to 4 mm long by 0.4 mm wide. Ashy dogweed has numerous stems and thread-like leaves. Floral stalks are capped with yellow flower heads consisting of 30 to 70 disc florets surrounded by usually 12 to 13 golden yellow ray florets. Woolly dogweed (Thymophylla micropoides) occurs in the same vicinity as ashy dogweed; however, woolly dogweed has spreading, shorter stems, less than or equal to 10 cm tall and spoon-shaped leaves. Desert bahia (Bahia absinthifolia) is a much more common species than ashy dogweed and has a similar leaf and flower color. Because desert bahia has fewer stems, its appearance is less shrubby. Also desert bahia has opposite lower leaves and leaf edges vary from smooth to notched to lobed. Woolly dogweed has spoon-shaped leaves as opposed to the slender or thread-like leaves of ashy dogweed. 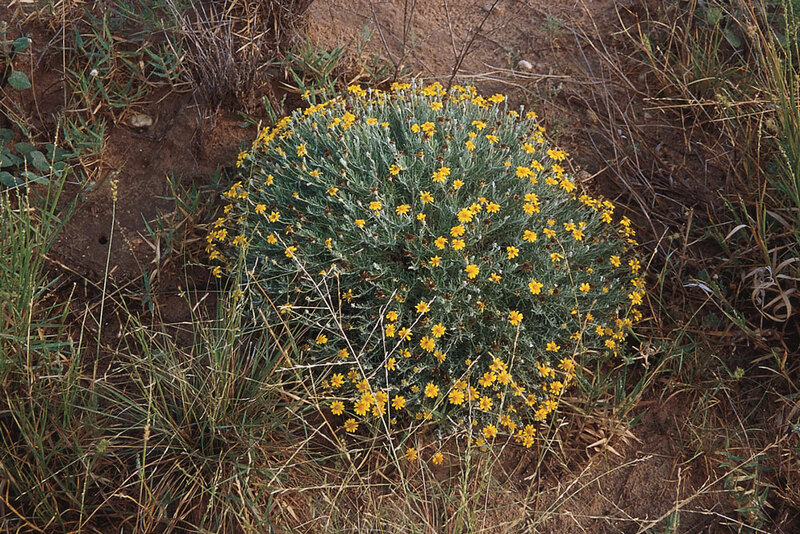 Desert bahia has fewer stems and therefore, its appearance is less shrubby than ashy dogweed. Also desert bahia has smooth to notched to lobed leaf edges. Ashy dogweed occurs in sandy soils in level or gently rolling grasslands with scattered shrubs. The yellow flowers of ashy dogweed are visible in this habitat shot. Flowering occurs from March to May, although is somewhat dependent on rainfall. Generally, ashy dogweed can tolerate infrequent, low-impact disturbances that turn over the soil but leave part of the seed bank in place and allow it time to recover. Continual soil disturbance eventually depletes the soil seed bank. Studies have shown an increase in germination and establishment of ashy dogweed at root-plowed sites where livestock was excluded. However, practices that remove the seed bank, like blading, or establish pasture grasses, which out-compete ashy dogweed, will decrease population growth (Williamson 2002).